Drift, slide, skid! 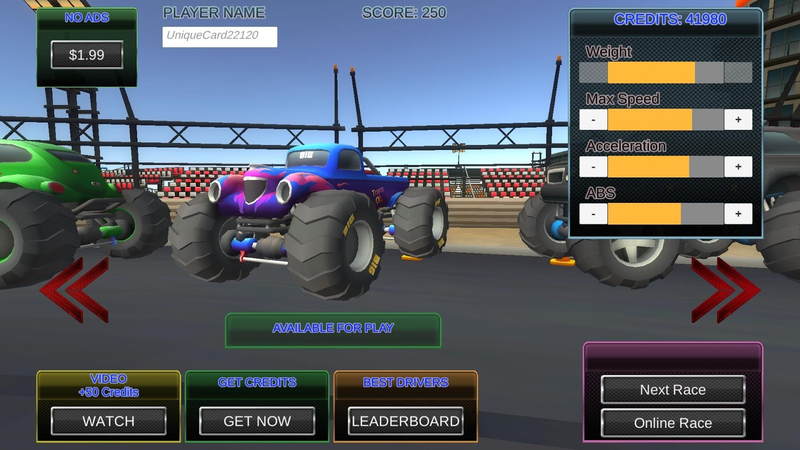 Toy Car Mini Racing is the isometric3Dperspective car racing game that makes racing funnier than ever.Asan experienced racer, you will have to manage driving your caronbumpers and jumps, narrow roads and even ice. Avoid collisionsanddon't let you get overtaken by the fast computer driven cars or,inthe multiplayer online mode, by players from all over theworld.The game is built on the best vehicle physics engineavailable forreal driving sensations and a very effective computerdriven carsartificial intelligence system. It features highdefinition 3Dgraphics, along with rock musics and realistic soundfx. If youlike car games, this one is different, this one is foryou! MainFeatures: -Offline or Online Multiplayer at no extra cost-8Vehicules simultenaously -24 Toy Vehicules from Saloon toRallyCars, Formula One, Monster Trucks, Pick Up, Lorries, LuxurySportsCars (Lamborghini) etc... -Different types of roads/sceneriesonmany tracks for different driving experience -Full 3D -TruePhysics-Best Computer Driven Car Artificial Intelligence-Realistics SoundFX and optional Rock Musics -Leaderboards -EarnBonuses on eachRace -Top game for racing -Best Mini Racing Game-Best Mini CarGame Race now and show off your driving skills!